A computer-generated image of Saturn's moon Atlas. Scientists now think it's flying-saucer shape comes from having snagged particles out of the planet's rings. The ringsof Saturn might have given birth to the giant planet's odd, small moons,scientists now reveal. 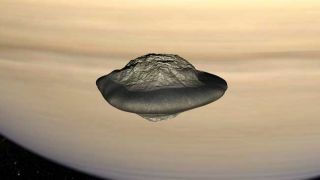 Theseunusual moons, some of which resembleflying saucers, might have clumped together from the bits of ice and dust thatmake up Saturn's majestic bands. However, calculations of theorbits of five small moons of Saturn that gather just within and beyond the peripheryof the planet's main bright rings revealed they are far too young for this tohave been the case. These must be less than 10 million years old — forinstance, they have bright, nearly pure ice surfaces largely unmarred by theimpacts expected from meteoroids. "There are stillnew objects forming in thesolar system today," said planetary scientist S?bastien Charnoz at theUniversit? Paris Diderot in France. "We used to think everything wasformed four, five billion years ago, but no! New objects are still formingtoday." Another curiousdetail about these moonlets is their low density overall — less than two-thirdsthat of body fat. This suggested they mysteriously contained significant emptypockets inside. One possibility forthe origin of these baby moons is that they were the offspring of Saturn'srings. Until recently, however, scientists did not have enough computing powerto model how this process might have occurred. Now using simulationsanalyzing the interplay between Saturn and its ringsand moons, Charnoz and his colleagues suggest these bizarre moons firstgrew from particles gravitationally attracted together in the rings' outskirts,beyond the distance where the planet's gravity stabilizes the rings. Theseloosely clumped moonlets were then flung outward with the help of the pull thatSaturn and the rings exerted on them. "The rings andthe moonlets are in fact a single system," Charnoz told SPACE.com. "They appear different but they are simply the different portions of asame system. The moonlets are born from the rings, and they transform the ringin return through gravitational interaction." "This tells usthat there are different ways to form solar system bodies," he added. "It tells us also that giant planets' environment are much more dynamicthan previously thought and that we have still a lot of things to learn." Charnoz and hiscolleagues detailed their findings in the July 10 issue of the journal Nature. Moons of Saturn,Earth and more? The new simulationsof Saturn's rings and moons may also have implications for the evolution ofplanets and their moons in general — including the Earth's moon. "This istheoretical support for the growing view about how there's an intimateconnection between disks and embedded bodies," said planetary scientistJoseph Burns at Cornell University, who did not take part in this study. "These satellites might have been born recently, meaning that the systemis evolving in some sense right before our eyes, although one would have tostay alive for some time to see real change." If we want tounderstand the origin of Saturn's rings, "which is still a mystery, wehave to investigate the moons," Charnoz explained. "This is asupplementary clue for their origin." Also, "is thisnew mechanism general enough to form all the icy moons of Saturn, likeEnceladus, Mimas?" Charnoz asked. "We have no clue but thisdefinitely deserves to be studied. What would be very interesting is to knowthe internal structure of Saturn's satellites, but there are very few clues.Maybe Cassini or future space missions will tell us." Moving beyond Saturn,this process of moon formation could shed light on Earth's moon. "Its formationprocess is very similar to what we describe for Saturn's moon, but the moonwould have accreted from the protolunar disks," Charnoz said. "Firsttests have shown that our model reproduces the moon accretion from theprotolunar disks in five minutes computer time." Moreover, "wewant to compute the chemical composition of the proto-moon while it wasforming," he explained. "This is a longstanding problem in astronomyas we still do not understand fully why the moon seems to have the same oxygencomposition of Earth and at the same time so little water and so littleiron."